I wanted to enter the "mens' only races" because I craved the excitement of sharing in a struggle for accomplishment of a goal. What exhilaration and elation when I could do what I had never expected! I had felt the bonds so formed to be much stronger than other friendships of a non physical base. I knew that there was really no legitimate reason why women should be left behind when it came to the running fun and sense of accomplishment. It irked me that there were rules saying that women couldn't enter races longer than what was included with the Women's Amateur Athletic Union permitted events schedule which at that time had been updated to include a 2 mile on the track. Later, I was to meet the woman responsible for getting them to include a women's half mile in the Olympics! What hurt me the most was the insinuation that my running with the men could possibly disqualify them from the Men's Amateur Athletic Union! My husband being involved with the men's organization at that time didn't want me to enter races because of this possibility. If he was writing up results of a race I had gotten into he would leave my name off the results. Bit by bit there were break throughs. Ralph Smith who was the AAU commisioner here in town was helpful by suggesting I stage a series of womens' "development runs" in Balboa Park. I hunted all over to find 10 women who could possibly run that far and we were off! I later staged a womens' "unofficial" 5 mile out at Point Loma during the usual Pt.Loma 10K except we started a mile up the road. We all had a lot of fun and companionship as we mingled during the race. The sharing bridged the gender gap! Later Jim Temples up in Solana Beach was a god send as he publicized that there would be a womens division in his San Dieguito 1/2 Marathon and that he was going to risk the repercussions! 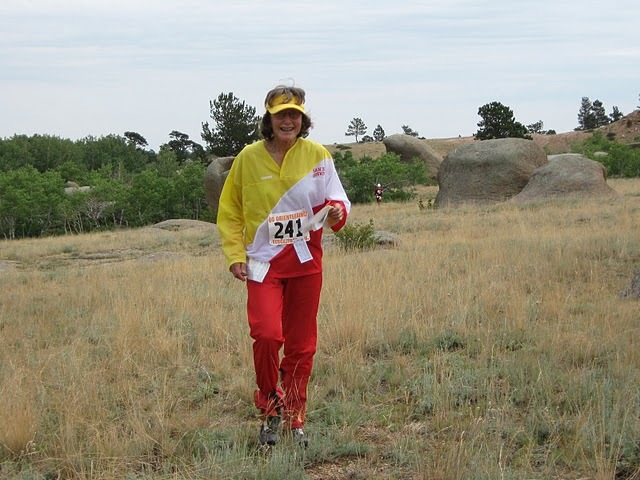 This was a race which helped my self esteem and confidance as I passed the true very first woman who ever ran Boston (Roberta Gibb) at the 10 mi. point! She had entered quietly at Boston as Bobbi Gibb with here hair up in a cap. The next year was the more celebrated woman whose boyfriend countered Jock Semples' attempt to throw her out of the race! A new National AAU Womens' Chairman replaced the one that had turned down my and the request of others on the east coast to have longer runs and mixed gender road runs. Dr Ken Foreman answered my letter describing the abilities and capabilities of the women here (even those with children) with encouragement to go ahead but doctor's permission slips were required. I continued to integrate the previously all men races in town. My husband Bill jumped on the band wagon and offered the first ever Women's division at our local Mission Bay Marathon in 1969 complete with beautiful shell awards that he had made! Carolyn McDonald a 12 year old and I were the local contestants and managed to get 1st and 2nd and made the cover of Track and Field News and written up in the newspaper! Carly's win with 3:42 and my 3:47 were respectable first ever times and even though the other woman from LA dropped out we were there in showing that females could do it! I went on with the fellows to Vegas where I was first woman in their marathon in 3:26 and Salt Lake City where we had a small contingent from San Diego and Edwin won the Men's Div in 2:32 and I the Women's with a 3:19 and Eileen Waters was 2nd woman I believe. It was a thrill as my then brother in law, Edwin, led the big Morman Days Parade and Eileen and I were alongside the big floats and were hailed in the newspaper there. Along with the Culver City Marathon they included a "test" women's 10 miler. We had to be checked by doctors before the race. Jackie Hanson gave us all tips about looking good no matter how bad we felt so that we could go on with increasing women's participation in runs. It worked and we were up and running! I ended up my marathoning career winning the Women's Division in 10 of the 40 I did and later placing in age group divisions. Eileen was a local woman with exceptional endurance and did a 50 miler in Culver City. The next year I went to the Culver City 50 miler too which was put on by the LA Striders. We did 3 more after that and one year it was the National AAU 50. Eileen won with her very even pace and became a world champ and I picked up 12 world records on the track at the same time since I was too fast at the first but did win Women's World Vet. title with 7:12. Women joined the running scene and loved it and after the initial shock of women who could run as fast as many of them-the men accepted us with open arms and admiration! I'll never forget the look of astonishment on the face of a fellow I was passing at Salt Lake as he said "oh no!" a woman is passing me!! He was a young fit looking man and I was a woman of 36 and I responded "yes, but how many miles do you put in in a week and he gasped "about 20-30". I said well I put in 60 + miles a week! I think that gave him a new perspective and appreciation and I would guess would lessen his embarrassment from then on! Accomplish goals and feel the improved self esteem that could carry me through the other challenges in life! Strong friendships from sharing a difficult and physical challenge. Recognition for what my hardwork has gotten me! Improved health,fitness and vitality that exercise and good diet can give!